Sione Po'uha, a former East High and University of Utah football player who’s now a defensive tackle for the New York Jets, is truly a Utah man. 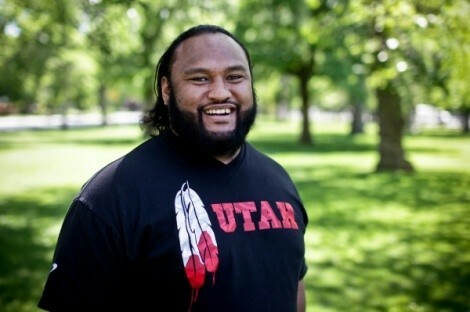 Back in Utah during the NFL lockout, Po'uha, along with seven other NFL players, will host a youth football camp at East High from June 30-July 1 (DreamBigFootball.com), and, on Monday, July 4, throw a free Fourth of July party at Liberty Park (600 E. 1300 South). The Bula One Love Fest kicks off at 8 a.m. with a 5K run/walk, booths, food vendors, free musical performances from The Wailers and others, and finishes with a fireworks show. What inspired you to hold Bula One Love? It stems from a company that I started here in Salt Lake City, which produces the Bula beverage, a relaxation drink. It’s also like the hometown kid is coming back—brings his story back, brings his life experience back. I love this place. I’m from here; I was born and raised here. The goal is to formulate it into a traditional [yearly] event. I’m looking at the event like, “Hey, come celebrate, let’s have a great time.” You just gotta do something good. I believe in karma. I believe in good vibes. Anything good, I’m for it. My dad passed away a couple years ago from pancreatic cancer. I’m a big advocate of the Huntsman Cancer Institute and the things they do, and was even before I found out my dad was affected by cancer. In the morning, we’re having a 5K walk and roll here at Liberty Park and we’d love for people to come out and form groups. We’ve got Moses and Kaylee Kinikini from The Biggest Loser, and they’re going to be the ambassadors of the walk. They’re coming from Idaho and bringing other contestants with them. We’ll have cheer stations, the Utah Rugby team and others. And afterward, we hope people come enjoy the booths and the great lineup that we have, free of charge—The Wailers, they’re ready to go. We made sure that they felt appreciated; they know that the people of Utah are ready to go. How do you see Utah now that you’ve been in New York City for six years? I always like to call myself a son of Salt Lake. People ask, “Where are you from?” Salt Lake. “Salt Lake? Where are you really from?” I was born and raised in Salt Lake. I come from the South Pacific, from Tongan descent, but I’m a Salt Lake boy. I get homesick for Crown Burger, for Banbury Cross, for Moochie’s. There’s no other Crown Burger, there’s nothing else like the spots we have here. There’s no Liberty Park—I mean, there’s Central Park, but I love Liberty Park. My wife was back in Utah at the Twilight Concert Series and sending me pictures, and one of my buddies was like, “What is that?” It’s a free show every Thursday. They were like, “Really, for free?” I don’t know how you do it in your state, but that’s how we do it in our state. Utah’s awesome. How did the Dream Big football camp come about? To really expose kids to hometown heroes is the storyline. You’ve got little kids with aspirations and dreams, and then you’ve got hometown heroes who were once in their shoes, coming back to replenish the cycle. I ended up gathering up a couple of my buddies, people who have roots in Utah, and said, “Hey, let’s host a football camp. Have it in my old stomping grounds at East High, charge $10, a nice, inexpensive football camp.” There’s a lot of expense that goes into camps. We’ve been blessed as players, and to come back and give back to the community … but at the same time, $10 is like allowance money—this kind of gives kids an incentive to save their allowance money. Then when they come to camp, they know that it wasn’t just paid for by Mom and Dad. When you make an investment, you become a little bit more alert and conscious and give a little more effort. I really wanted to interact with a lot of people. I’ve been keeping a great relationship with the people who watch the show. The same thing with our football camp. Yeah, there’s this kid from Utah, but you never have the chance to know the kid from Utah. You have a lot of players from Utah and BYU, but you just see them on TV and that’s about it. This is an opportunity for people to come out and see that this guy wears flip-flops from Old Navy just like everybody else. We’re no different. It’s a way for us to give back, interact with the community, let ’em know that we care. What was it like facing off with fellow Utah player Chris Kemoeatu in the AFC Championship? It was a surreal moment. I hadn’t played against Chris since the University of Utah, and that was only in practice. And then in the AFC Championship game—and we’d played like two weeks earlier—it was the weirdest thing. We form a pretty strong brotherhood at the University of Utah, and we stay pretty tight. You can’t believe you’re going up against your buddy. Do you hit him hard? Do you punch him hard? But at the end of the day, both of us understand that we’re in our professions, we have careers. We’re competing opponents all four quarters; anything outside of that, we’re back to the same old Utah boys who have roots here in Salt Lake. Once the whistle blows, we’re competing at our best. Then after, we give each other hugs, text each other, all those types of things. It’s fun, but in the game, you’re in the moment. What’s life like during the NFL lockout? We’ll be in Utah till the lockout’s done. It’s kind of bittersweet—I want it to end, but I just got here. I know that home will always be home, and I hope it’s only four more weeks and then we’re headed back to get to work. How many wins do you foresee Utah getting in the Pac-12? Nowadays, it is common for teams to go undefeated. Especially University of Utah—it’s kind of what we do, really. All the programs here in the state are great. I went to Utah, so I keep a close eye. I hope we go undefeated. We’re in a great conference, and they’re getting a great team—and a great state, a great fan base, a great city. I’m sure we’re a great asset to the Pac-12. Especially with the University of Utah being a commuter school—what’s wrong with a commuter school? Last time I checked, we were undefeated twice, in five years, with two different coaches. With all the NFL talent that comes out of Utah, do you think we’ll get a pro team someday? It’s real complicated to get that, as you can tell with the lockout going on. You gotta have a big base of fans. I think people really enjoy rooting for the local college teams, and the progressions those teams have made—going to the Pac-12, going independent. What’s cool about Utah being like this … when Utah goes to the Sugar Bowl, goes undefeated, it’s so private, it’s not so commercial, so people feel an ownership. Isn’t that what the home team is all about? Everybody’s into the energy drinks: “What will give me more energy, what will get me up faster?” But there’s a yin, and there’s a yang. If there’s an energy drink, there’s gotta be something on the other side of the realm. I’m a football player. I use energy drinks, and you either come down pretty hard or you wait it out. I figure if there’s a way to go up, there’s a way to steadyline yourself. I knew that this was the effects of kava, and a couple years ago was figuring out, maybe there’s a way to put this together and make a drink. It took a couple years of research, finding labs to make it, making sure we chose the right flavors, the right mixtures—we had a good 150 mixtures to try. Then have focus groups, tests, focus groups, tests … we had bartenders, yoga instructors, football players, normal people, very diverse focus groups. We feel that we came out with a product that was up to our standards to share with consumers. The corporate name is Night Rain, which is actually my last name, Pouha, in English. I’m pretty involved. Anything from carrying the Bula from the warehouse to throwing the Bula fest is how involved I am, especially now during the lockout. During football, not as much—I have a general manager who helps me take care of stuff. But I really know what is going on. It does help when I go out to talk to people, to understand the product.